In 1992, at the age of twenty-four, I back-packed through India. This trip was to be the first of many journeys away from the privileged world in which I was raised. It was an eye and soul opener. Unseen beauty lay beside unspeakable poverty, rare scents in the midst of putrid stench, and the visual stimulus of pure powder pigment made my soul resonate to the memory of very tender childhood. My earliest deep visual impression stretches back to my boyhood. On the far wall of the living-room hung what seemed like the biggest expanse of blue. In time, I would learn that it was a Monochrome by Yves Klein. It was two meters high by four meters long; very big for a little boy. I was engulfed and mesmerized by the live powdery surface of the painting. At that age I was unaware that it was the red in Yves Klein’s particular tone of ultramarine that explained why I was swept by warmth in an otherwise cold color. It was a purely physical experience, one that would later prove to be the core of my appreciation of art and all things visual: sight is a sense among those of smell, taste, hearing and touch. Therefore, seeing is first and foremost sensory: an experience akin to tasting and touching. Among the wonderful things I discovered in India, was the feeling of shedding much of what I had learned and I was able to tap into a deeper level of my consciousness to navigate this new experience. Earlier, when still a student at Cornell University, I had argued that certain poets and painters in the turbulent pre-revolutionary and early Soviet era, resorted to abstraction in an effort to lay the foundations of a world that could not, by its very nature, be rooted in the representational tradition of Tsarist Russia. 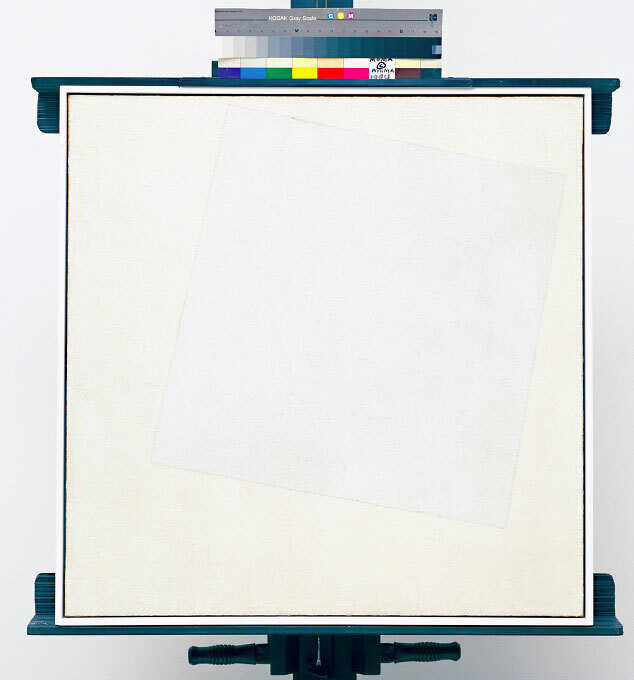 Recently, I felt this bliss upon seeing White on White, a painting by Kazimir Malevich at the Museum of Modern Art (Fig. 1). My experience in India was marked by the abandonment of many things I had been taking for granted. I felt like the hero in Yevgeny Zamyatin’s novel “WE”, in which the author develops a highly charged eroticism without ever so much as using a sexual word. Everything is suggested through marvelous abstract images beginning with the name of the female character “O” and ending in an explosion of color. As these memories course through my mind, I realize that as much as I may have had the feeling in India of shedding what I had known, the very path of liberation had been shown to me by artists and poets. India was a kind of reversal of my former perspectives: a place where life can be given little value, but where it is also celebrated and exalted; a place where mythology merges with history; a place where the linearity of time is defied. Casting about with no clear purpose I began to take photographs in India in order to document my trip there. This turned out to be the first stage of the development of an instrument by which I could address the eternal existential questions: who am I, and what place do I have in the universe? Although my experience as a photographer was limited, my eye was well trained. I grew up with art of all sorts, from different time periods, and studied art and literature when at school. At Le Rosey I argued that Balzac was a pre-cursor of Impressionism: in his novel “La Peau de Chagrin” he gives an impressionistic description of the roofs of Paris and a marvelous glimpse of a woman bathing that recalls a scene painted by Renoir. At Cornell, I read Albert Camus’ “L'Etranger” across the work of Yves Klein. In fact, I reproduced a portrait in reverse in order to give a visual representation of Camus’ description of a scene in the beginning of the book. This was to be my first experiment with reversal photography(Fig. 2). The idea stayed with me. Later, while directing a contemporary art gallery and artist’s studio in Switzerland, I designed a black and white catalogue in which all the images were reversed. Looking back on the evolution of my technique, I realize that an event in the life of Yves Klein greatly impressed me: the artist was fascinated with the carbon traces that he noticed on a wall at Hiroshima. They are the visual testimony of a man and ladder caught by an atomic conflagration. Man and ladder were vaporized, but the carbon 14 stayed imprinted on a wall (Fig. 3). When I traveled through India, the first photographs I developed appeared devoid of energy compared to the monuments I had just visited. I thought about how the paper prints fell short of the majesty of the temples; they seemed like mere postcards. On the other hand, the tiny images on the negative strips seemed to burn: stone was transformed into molten lava and shadow became light. As I looked at the strips I tried to envision the instant when the shutter clicks open and the emulsion on the celluloid reacts to the sudden onslaught of light. What magic occurs at that micromoment around 1/100th of a second when light hits the negative! Light is caught; a moment is engraved in the negative like the man and the ladder at Hiroshima. tranquil guest-houses at night in India. I was fascinated by the manner in which negatives reveal what the eye cannot see, the complement of what the eye does see. I tried to envision how light travels and gets lost. I marveled how black is the absence of light and white the sum of all colors. I tried to see how light travels through space and hits an object: some rays are absorbed and others reflected. The latter are those that allow us to see color; it is those that affect the emulsion on the celluloid. At this point, my thoughts get lost like the path of light. I cannot really follow what is reflected and what is absorbed. Everything seems undefined, the line between what is and what is no longer, clear like the ladder and the man at Hiroshima, like the painting Yves Klein left us in tribute to this terrible instant (Fig. 4). It is the “space between” that I discovered in India, that space between the Ying and the Yang, between the sum of all colors and its absence. I found this space in my negatives. I proceeded to find a way to enlarge them in order to explore that magical gap.